Church History: Founded in 1874 by the Rev. Edward A. Chippey. Click here for the complete history on the church's official website. St. John A.U.M.P. church now makes its home in the former St. Michael's church building. The following brief History of St. John's A.U.M.P. Church is taken from the Home Directory of the Colored People of Chester, 1906 compiled by Lawrence L. Barrett & C. I. Wilson. This reference is available at the DCHS research library. 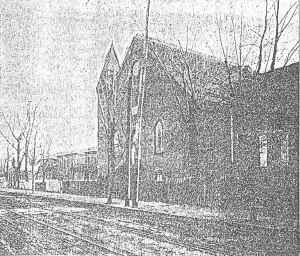 The above named church is located on Seventeenth street, above Walnut street, and was organized and built by the late Rev. E. H. Chippey, of WIlmington, Del., in the year 1874. A short while prior to that year, a committee, consisting of Rev. E. H. Chippey and Brethren Isaiah Peck and S. L. Nichols, as secretary (the last named now the pastor of the church) was sent from the parent church in Wilmington, Del., to select a site, purchase material and make all necessary arrangements. The first board of trustees included the names of the following well-known men of that day, some of whom still survive: William Sturgis, Benjamin Williams, Senaca Allison, Charles Walker, Purgeon Wilson, William Caulk and George Hinson. The new church, with a membership of 35 persons, continued to grow in membership and strength, the original building being replaced by the large and commodious church now in use, which was rebuilt in 1901, under the pastorate of Rev. Thomas Skinner, before whose time the late Rev. C. S. Temple was pastor for a number of years. Board of Trustees - Enoch Buck, Thomas Jones, Stephen Bishop, Henry Derry, Elias Johns, William Laws, Benjamin White, William Morgan, John Neal. Star of Hope Club - Mary A. Temple, chairman; Estella Hatfield, sec.